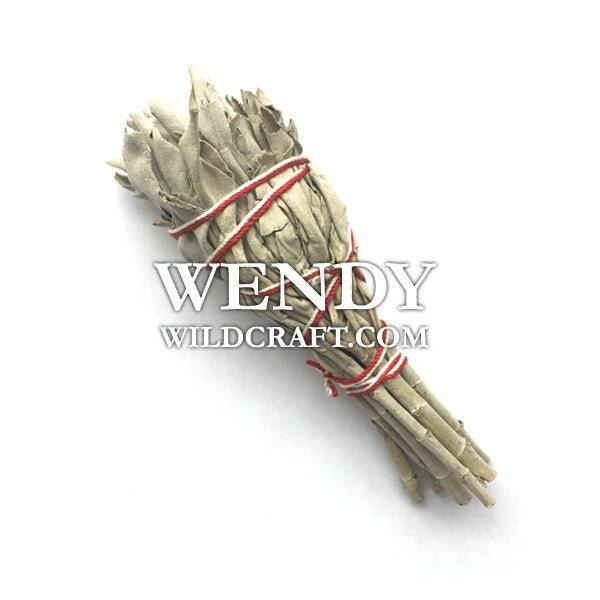 1 mini white sage bundle. Approximately 3 1/2". These herb bundles are made with California white sage. To use a smudge stick light the end, gently blow out the flame when you feel it's good and lit. Slowly wave the herb bundle in circular motions as you move around the room, person, or object. Use a fire safe dish to catch any fallen ash. When you are done extinguish your herb bundle by tamping it in a fire safe bowl. As with all other herbs white sage is beautiful and sacred. If you can, it's suggested to grow your own white sage due to white sage being overharvested in the wild. If you can't grow your own white sage and you wish to work with white sage, the white sage I sell is grown in the USA. Haven't used it yet but nice.